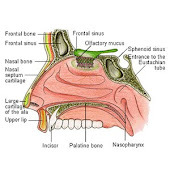 By now those of you who have been following this site, will be aware of the terms external and internal nasal valve collapse. When thinking of those terms we automatically think of lateral collapsing of the nasal wall towards the septum particularly with inspiration. But when a significant amount of your tip cartilage (the middle and medial crura) are excised during rhinoplasty you will likely notice, as is in my case, that your nostrils are now significantly less projected then they were before your primary nose surgery. In fact the short projection of my nostrils were pointed out to me by a revision rhinoplasty surgeon a few months back. At closer inspection of the base view of my nostrils, I would guesstimate (since i don't have nostril pictures of my original adult pre-operated nose) that my nostrils are close to half the length of what my nostril projection was prior to my primary surgery. I have had my tip reduced in all of my three revision rhinoplastys, as well as reduced and reshaped in my primary. My nasal spine was also reduced in one of my revisions. The problem of an overly large nasal tip was a result of my primary nose surgeon being overly aggressive with my bridge (I had a very large hooked shaped nose), so by overcompensating for that, the surgeon ended up giving me a ski sloped nose with a very long protruding tip... the Cyrano effect A big cosmetic assessment mistake that was made by my last surgeon was not understanding how to safely bring into balance the longer tip with my scooped out bridge. The safe, smarter but more complex procedure which should have been performed, was to add grafts to my bridge building it up to line up better with my tip. Another possibility which could of been performed alone or in tandem with the former was to reshape the tip cartilages using sutures and rotate it downward, since I already had some excision to my tip cartilages previously. Unfortunately the surgeon wasn't that experienced or skilled so he decided to opt for quick & easy 'fix' and aggressively excise the tip cartilages further down, not taking into account all the previous excisions i had. So in essence he was able to achieve the cosmetic goal of reducing the length of my tip, but unfortunately not without major consequences. I don't believe I have tip ptosis at least not a very distinguishable form of it because my tip was already positioned fairly high after my first revision surgery. However it's very likely that the major and minor supporting tip structures have been negatively impacted on, as well as the vascularity of my skin and soft tissue envelope. I would assume that in order to correct my flattened "shrunk" nostrils i would probably require tip projection as well as correcting the lateral collapse I have, to achieve a normal and relatively proportional sized nostrils ( proper ratio's) for the base of my nose. 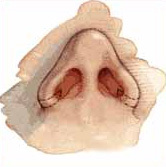 It's also important to recognize that anything which decreases the nasal valve cross sectional area can negatively impact the nasal airway, creating further feeling of nasal obstruction. Even though there's a significant amount of information about reducing flared out nostrils for cosmetic reasons, not much exists for increasing or restoring the size of one's flattened out nostrils due to prior nose surgery's. At least not that I have found online. As far as nasal tip ptosis is concerned I will discuss that in greater detail on another post.